What effect does fluid laden with debris such as sand, grit, and rust have on the HydroPull? It is good practice to filter the fluid to minimize the erosional effects to the entire BHA. Dirty fluid containing excessive debris such as grit and sand can damage the internals of the tool over time. Internal components of the tool can become eroded and lessen the impact of the tool and in some cases, cause it to stop hitting all together. Refer to our paper TR-249 Best Practices for Cleaning Wellbores During Composite Plug Milling for recommendations on surface filtering equipment and micron levels. 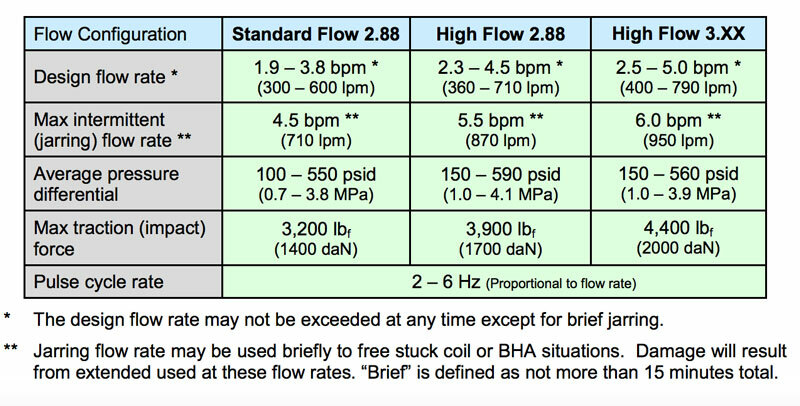 Is the HydroPull running at the designed flow rate? The HydroPull is highly tunable with many flow and impact configurations. These configurations are set at the Tempress facility before shipping. 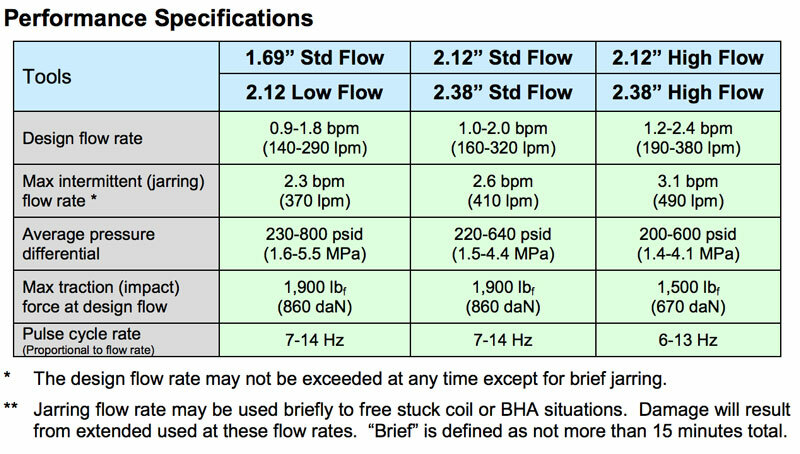 The Performance Specifications for the various impact levels are listed below. What should be done prior to using the HydroPull if the tool has not been used for more than one month? The internals of the HydroPull are safeguarded against the tool not being operated for periods of prolonged inactivity. However, it is good practice to “dry start” the tool on air prior to use. Tempress provides the tooling (air test adapters) required to accomplish this and the instructions for utilizing the air test adapters are included in the Operators Guide. What level of filtration should be employed when using the HydroPull? Abrasive fluids will greatly reduce the effective life of the tool. Only clean, lowsolids fluids should be used. Produced water can be used provided any sand has been removed. Surface filtration for all but the cleanest fluids is required for best reliability and life. Use of the downhole screen sub provided is also highly recommended. For a complete description of best practices for fluid filtration, see TR-249 Best Practices for Cleaning Wellbores During Composite Plug Milling. The HydroPull tool may not function reliably if large volumes of fine sand are recirculated. A redundant filter manifold (see below) is recommended in case any fine sand is present in the supply water. This may occur after gel sweeps are pumped and the supply water viscosity is increased. Gel can prevent fine sand from settling out in the return tanks during operation. A pair of two-stage filters (bags or cartridges) should be incorporated in a manifold as shown. Isolation valves allow replacement of one pair of filter elements without interrupting flow. A charge pump may be needed to ensure that the high-pressure pump does not lose suction as filter elements load up with debris. The second stage filter in each pair should filter to 50 microns. The first stage filtration may be 125 microns or larger depending on how quickly the filter elements plug. Differential pressure gauges should be provided so that the operator can monitor the status of the filter elements. If the pressure exceeds the filter element specification, it must be replaced. The differential pressure must be monitored regularly or the pump can lose suction and debris bypass can occur. Question: Should “nano beads” be used with the HydroPull? Answer: The friction breaking power of the HydroPull tool normally eliminates the need for friction reducing beads. The use of conventional beads that are larger than .001” is not recommended because they may jam the tool. If a customer insists on running beads, care must be taken to ensure proper mixing and to keep the pumps engaged until all the beads have passed the BHA. The use of these beads may incur additional redress charges due to excessive wear. Should friction reducers and pipe-on-pipe lubricants be used with the HydroPull? The friction breaking power of the HydroPull tool normally eliminates the need for friction reducing chemicals. Because each wellbore is unique, some wells are more tortuous than others and may benefit from the addition of these chemicals. Industry technical papers have documented the performance of the HydroPull in wellbores without friction reducing chemicals versus competitive friction breaking tools requiring friction reducing chemicals. What happens if the bags or filter elements on the filter skid become worn or fail? Two main types of filters are utilized in plug milling operations: cartridges and bags (a.k.a. sock filters). Both filter types are available in a variety of filter media and efficiency ratings and employ a different flow path for filtering the dirty filtrate. Cartridges utilize an outside-in filtering method whereby the dirty filtrate passes from the filter vessel’s inlet and through the cartridge’s media to the perforated inner core and out the clean side outlet. On the other hand, bags utilize an insideout method to filter whereby the dirty filtrate passes from the filter vessel’s inlet and through the inside of the bag, through the media, then to the perforated support basket and out the clean side outlet. At high differential pressures, string wound cartridges, especially those manufactured with cotton yarn, can become very heavy with fluid and entrained sediment. Continued operation above the recommended differential pressure can cause the filter element to deflect away from its top and bottom sealing mechanism and release, or unload, sediment into the clean fluid stream. Finally, an improper seal between the top of the bag, or sock filter, and the support basket can result in bypass of sediment around the filter bag, passing from the filter vessel inlet, around the top of the bag, and directly through the perforated support basket. At this point, the dirty and clean side would directly communicate, thus allowing a high percentage of particles to remain in the fluid. What is the maximum number of plugs that can be milled before redress? The number of composite frac plugs in a wellbore does not limit the performance of the HydroPull. The HydroPull consistently mills well in excess of seventy (70) plugs in a single run at depths in excess of 21,000 ft. MD and lateral lengths well over two miles. Question: What is the relationship between micron and inches? 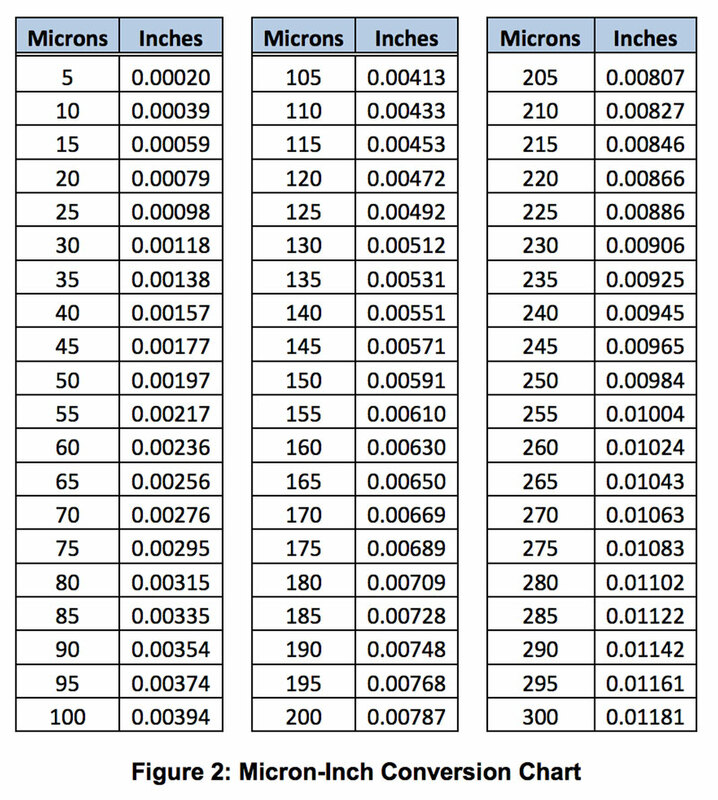 Answer: Figure 2 below illustrates the relationship between these numbers. Why is it recommended not to stop the pumps during operation of the HydroPull? The HydroPull contains internal components that slide past each other with tight tolerances. When the pumps are shut down, sand and debris have the tendency to settle in the BHA components. Although rare, debris can occasionally settle into areas of the HydroPull causing the internals to jam and stop the tool from pulsing. If this occurs, we recommend a “hard start” by increasing the pump rate to around 5 to 5.5 bpm. It is also recommended to run the pumps at a minimum of 0.5 bpm when RIH and POOH to maintain movement of the internal components of the HydroPull. What are the effects of acid on the HydroPull? The HydroPull is acid tolerant. However, to minimize the risk of damage to the HydroPull and to reduce the chance of extraordinary damage charges, it is not recommended to spot acid in the tool, but to rather open a circulating sub and pump one coil reel volume of clean water through the HydroPull after pumping acid. What are the effects of acid and temperature on the HydroPull? Limiting each of these factors will keep tool performance and reliability maximized. Increasing acid concentration beyond 1% can be allowed provided the other factors are well controlled. If temperature is limited to 120oC (248o F) and all the other exposure factors are limited, acid concentration can be elevated to 15% while still achieving an acceptable performance life. The use of acid results in an acid charge. Extreme wear and damage results in an excessive damage charge. When acid is not being pumped, the maximum temperature rating for the HydroPull is 400°F (200°C). What is the difference between the HydroPull and the HydroPull™ SC? The HydroPull™ SC Stimulation & Cleanout Tool incorporates a water-hammer valve that generates intense suction pressure pulses in the completion. These pulses vacuum the wellbore, pulling fines and debris from behind completions and out of the formation. The tool is equipped with jet nozzles that dislodge fill, packed sand, tar, paraffin and scale. How do I know if the bypass port installed is correct for the job parameters? Determine the bypass port size by inputting your job parameters in the Tempress software program, MGS™ performance model. The Tempress engineering and sales team can conduct software training and assist in running the model. How much fluid is discharged from the bypass port if no N2 is flowing? What happens when N2 flow is reduced or stopped? Any remaining N2 present will exit out of the bypass port along with some fluid. If nitrogen is completely stopped, fluid will continue to flow out of the bypass ports, even though no nitrogen is being pumped. What is the surface indication if flow were blocked somewhere below the Motor Gas Separator or if the motor stalled? All of the flow would be forced out the bypass port (which is sized for the gas flow only). This would cause a pressure increase, similar to the effect of stalling the motor without the MGS™ in line, but to a lesser extent. What can cause a MGS to stop separating? Though uncommon, a large piece of foreign mater, such as pieces of a pump seal, can jam the tool and prevent the drum from rotating. Running a Tempress screen sub above the tool can prevent certain sized debris from entering the tool and damaging the internal components of the MGS. What happens if the Motor Gas Separator drum stops rotating? The fluid paths through the MGS are large enough to always allow full flow through the tool; however, it will not separate the gas from the commingled fluid if the drum is not turning. In that case, some small amount of two-phase flow would be discharged out the bypass port and the remaining commingled flow would go to the motor as though the MGS™ were not in line. In this case, damage to the motor’s stator is possible. What happens to the Motor Gas Separator when a foaming agent is pumped? Surfactant will not affect the Motor Gas Separator’s ability to separate gas because the gas fraction inside the surfactant is too low when it passes through the drum. As the foaming agent passes through the gas ports in the tool, the gas expands and water and surfactant will mix to generate foam in the annulus.